Now we have your attention why not check out this beauty out. 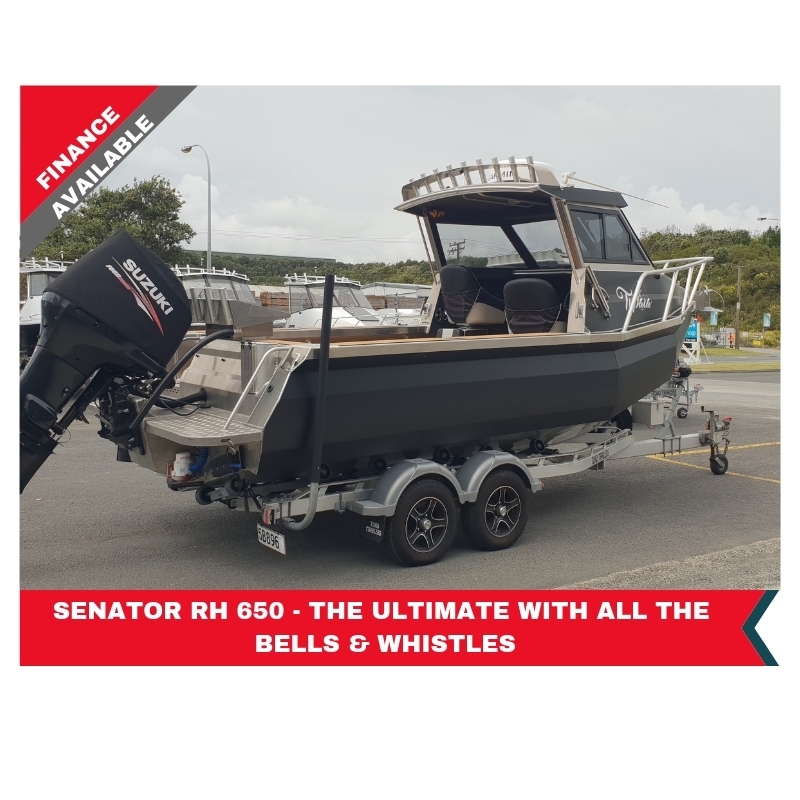 This Senator 650 boasts all the things every serious fisho, diver, or family day out needs. Sitting on a 2016 Toko Aluminium trailer rust will be a thing of the past giving you years of trouble-free towing . The hull looks sharp in the custom black wrap matched to the Suzuki 200HP. Having done only 132Hours it even has a push button start! – Awesome.! Moving up into the deck you will see the custom fitted SeaDek making this Sentor 650 a one of a kind. If you are a serious Fisho then you will love these twin tuna tubes and live bait tank, better yet after that big catch you can wash the mess away with the high-pressure deck wash that is stowed away ready for when you need it. If you like to go deep, then you will appreciate these Hapuka plugs that have been installed for your electric reels making it easy to land those big deep water fish you have managed to find on your Garmin 7412 Yes it has Auto pilot and yes has Radar too. This boat is truly one awesome machine. This boat has plenty of other options fitted you just need to come and check them out for yourself. At $129,995 this boat won’t last.